How To Build A Shed With Style! How to build a shed: If you are thinking of building a shed no doubt you already have a purpose in mind. Too much stuff to store and you're tired of it sitting around and cluttering up the yard. Your shed design will depend to a large extent on the planned use. Firewood storage, gardening tools, potting shed, garden shed, tractor storage etc. There are dozens of considerations, but they aren't complicated. How big the doors should be, size of the building, location, etc. will become clear when you consider the purpose. Some larger sheds are used for animals or for a workshop and large equipment and require extra detail in the way of insulation and wiring and lighting, but outdoor storage is generally the purpose of a shed. Keeping your stuff out of the weather and off the lawn and out of sight makes your yard look a lot neater. 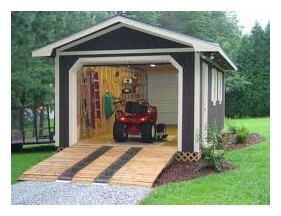 But the shed itself should look presentable and can actually enhance the appearance of your property. 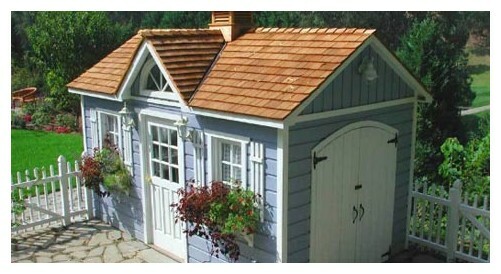 No matter the purpose of the shed, plan for it to be good looking as well as functional and you'll end up much happier. A snappy appearance will likely cost a little more, but your spouse will be happier too. A happy spouse is definitely a good thing. The first example of shed construction I am going to show you is for a rather fancy shed. My customers, Herb and Sharon want functional as well a pleasing appearance and showed me a few pictures of sheds in various catalogs as examples. With those ideas in mind, we planned the location and the size. This may seem like a complicated way of how to build a shed, but you can simplify it easily. 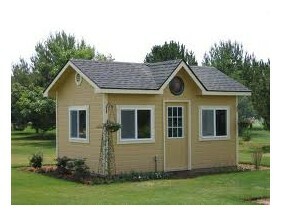 The first example of shed construction I am going to show you is for a rather fancy shed. 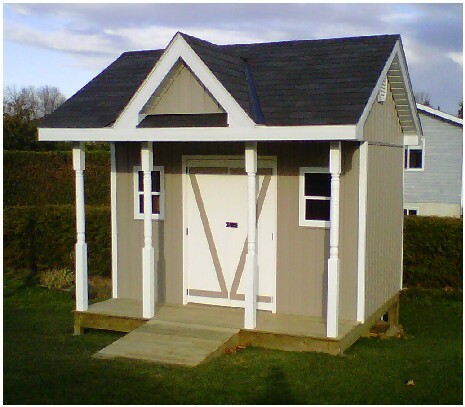 My customers, Herb and Sharon might not know how to build a shed, but they want functional as well a pleasing appearance and showed me a few pictures of sheds in various catalogs as examples. With those ideas in mind, we planned the location and the size. This may seem like a complicated way of how to build a shed, but you can simplify it easily. Firstly, Sharon wants the shed to store a lawn tractor at one end and the other end will be used for gardening tools, work bench and other storage. She is an avid gardener and will be doing some potting in the shed. She also wants to use the roof rafters for storage and asked that we keep it as open as possible for this purpose. She wants lighting inside and electrical outlets both inside and out. 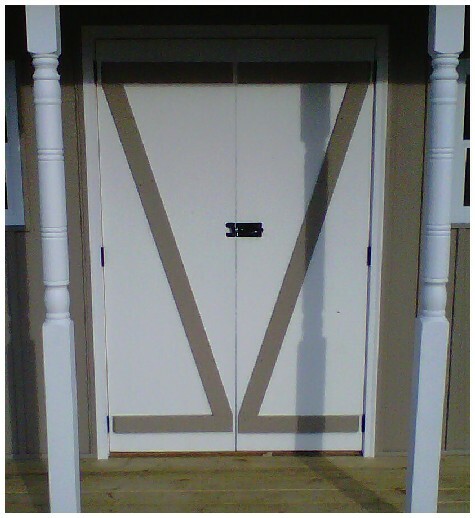 Windows are required in the front on either side of the double doors and as the shed will be built on a sloped area of the lawn, there is to be a skirt all around it to prevent critters from making a home beneath. This shed will also come complete with vinyl board and batten siding, soffit, fascia eavestroughing (gutters) and a front deck and tractor ramp. As I said, this will be no plain-Jane shed. Sharon and Herb had decided that the location of the shed is to be the center of the yard, near the back and facing the house. The back of shed will over hang a drainage swale and the front of it will be level with the main lawn. Your shed might not be as fancy as this (or maybe it will be the Taj Mahal of sheds), but you'll learn a lot about how to build a shed from the various steps. The first step was to establish the shed location using stakes in the ground. The idea of this of course is to get the shed foundation square and oriented properly. I should mention that local bylaws state that a building permit is not required to build a shed if the shed is 100 square feet or less. 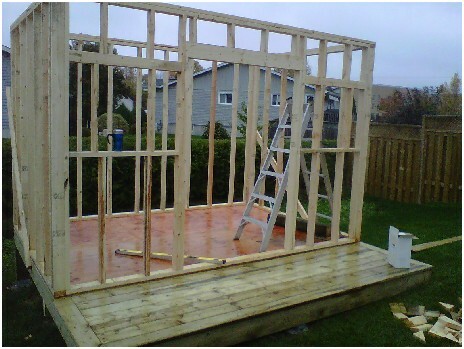 You should check with your local municipality about bylaws that may affect the construction of your shed. In this case, my customers decided that an 8 foot by 12 foot shed was plenty big enough for their purposes so they could save the expense and red tape of a permit. My design though called for the storage space to be 8'X12'=96ft.sq. plus a 36 inch porch out front. The total footprint would be 12ft. X 11ft. but the actual shed portion would be within the bylaw allowance. I'm thinking the building inspector might argue the point, but it's sometimes better (and less expensive) to ask for forgiveness rather than permission (...please don't tell anyone I said that). After discussion of the shed design with Herb and Sharon and after staking out the location of the base of the building, I was forming an idea of the final appearance of the shed. Initially they had wanted two entries. On the west (left) wall was to be a double wide door and ramp for the tractor and in the center of the front wall was to be the 'people' entry door. However, the sloping grade toward the rear of the shed meant it would be difficult to set the ramp on level ground and so it was decided that a double wide entry door in the front would be best and then the ramp could be shorter and not so steep. Now it is time to mark out and install the footings that will form the foundation of the deck. Click the image to go to the page you want.